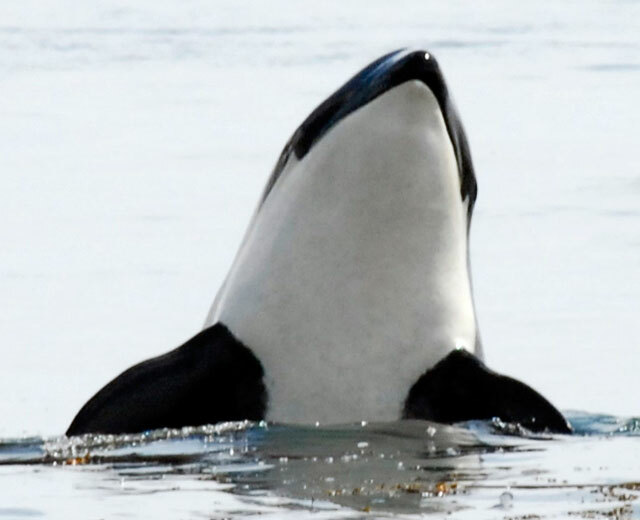 A "spy hopping" Southern Resident killer whale in the San Juan Islands. Image courtesy of NOAA. EPA Region 10 hosted a policy forum on PBDEs and Southern Resident killer whales on June 6th, 2013. The policy forum was the culmination of technical workgroups and provided an opportunity for senior level staff at the Washington State Department of Ecology (Ecology), NMFS, the Puget Sound Partnership, and EPA to learn about and discuss the issues surrounding PBDEs in Puget Sound, especially as they relate to killer whales. Workgroup participants included national PBDE experts, local wastewater treatment plant operators (King County and LOTT Clean Water Alliance) representatives from Ecology, NMFS and EPA, as well as Canadian researchers. Workgroup and policy forum participants acknowledge the need for additional monitoring of PBDEs and other flame retardants/persistent bioaccumulative toxics in Puget Sound. Discussions regarding a Puget Sound-wide monitoring program for PBDEs continued via the Puget Sound Ecosystem Monitoring Program. With leadership from EPA and NMFS, the Puget Sound Ecosystem Monitoring Program convened a sub-workgroup on PBDEs during Fall 2013. See the report on PBDE Monitoring Recommendations.